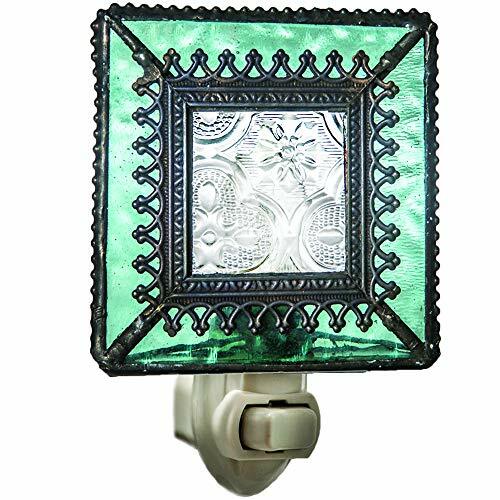 This glass night light featuring English Muffle glass is a true stand out. It is designed at 3" x 1 1/2" x 4 1/2" and features warm Aquamarine Blue English Muffle glass that frames clear vintage glass. Elegant filigree is laid on the seam between the two pieces of glass, further adding dimension and beauty. Dark beaded edging completes the look. This sophisticated glass home decoration is designed for use in any room or dark hallway. Designed and Manufactured by J Devlin Glass Art 3" x 1 1/2" x 4 1/2"
If you have any questions about this product by J Devlin Glass Art, contact us by completing and submitting the form below. If you are looking for a specif part number, please include it with your message.